This gloss color creme's rich moisturizing formula provides a veil of protection to help ensure the brilliant shine of your color treated hair. A professionally inspired formula for fashionably vibrant coloured hair. The best way to use this gloss is to either apply a dime sized amount onto towel-dried hair and comb through. Or you can apply some of the product on dry hair to finish your hair style. This product costs around $10. For the past few weeks I have dyed my hair quite a few times which comes to no surprise that I gravitated towards this type of product. I tend to use this more when it's the second or third day after washing my hair and I see that my hair looks dull. 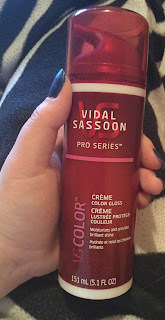 I definitely love using this product when my hair needs a little extra help. It adds shine and helps get me a nice finished look to my hair. I am going to give this gloss 4.5 stars on 5. Truthfully, I don't have any complaints with this product. 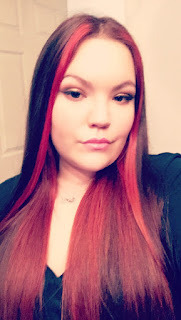 It adds shine and enhances the vibrancy of my hair color. It helps me finish my hair style and moisturizes my hair. The only thing I do have a problem with is the fact that this product is not cruelty free. If it was cruelty free I wouldn't have a problem giving it a perfect rating. Otherwise, this is a great product.